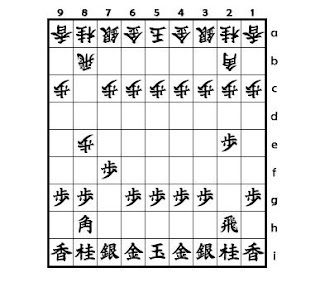 Yamajunn's Shogi opening traps: classcial Kakukawari opening : part 1.
classcial Kakukawari opening : part 1. 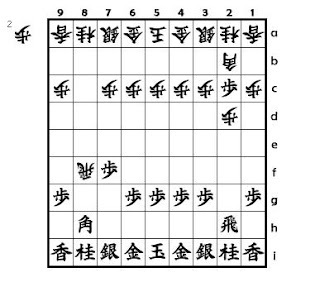 Shogi Opening traps : classcial Kakukawari opening : part 1. The diagram 1 is one of the standard beginning of classical Kakukawari opening . You may think Gote can exchange the 8th file Pawns . If Gote exchanges the Pawns , how the game will advance ? Gote exchanges the 8th file Pawns . But by the exchange not only Gote but also Sente has a Pawn in hand . Sente also pushes his Rook Pawn with 5.P-2d . Gote captured it and this capture makes a space on 2c . Sente drops a Pawn with 6.P*2c and kills the 2b-Bishop . Then Sente gets an advantage in the diagram 2 . By this reason , Gote will move 3...G-3b or 3...P-3d .